Mill Pond was named in recognition of the sawmill operation that used this pond for power. The sawmill is an important component of Richmond Hill’s culture heritage because it was part of what made the heart of Richmond Hill an attractive place to settle in the late 1800s. Mill Pond Park is stage to the popular summer Concerts In The Park, and it also hosts the annual Winter Carnival and Mill Pond Splash Events. South of Mill Street, visit the Millennium Garden and find your way to the Museum of the Streets (look for the sign). You can also stroll along the beautiful trails that make up the Mill Pond Park Trail. Resident waterfowl are another reason that Mill Pond Park is a favourite for many. Please help keep our wildlife wild by not feeding the birds. 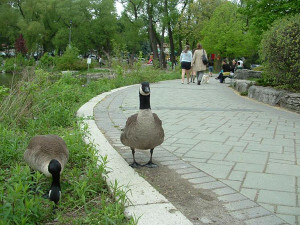 The Pond Story told on signs in the park, explains why feeding Canada geese is harmful to them and to the environment. In the winter the Mill Pond opens for outdoor skating! This family friendly park offers wonderful entertainment year-round. For more information please visit the Town of Richmond Hill’s website.